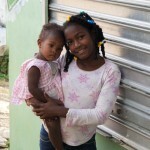 Evelyn lives in the beautiful Dominican Republic, but her life is a different picture. She lives with her father who provides food for her and her sisters, but nothing else. There have been times when the girls have lived without the basic necessity of soap—and the simple dignity found in being clean. Their father also refused the tarp graciously offered by a local couple from the church to fix their leaky roof. Evelyn makes necklaces to earn a basic salary. This helps her live day to day. Women worldwide have an incredible amount of resiliency, dreams, hope, and power, but they need someone to invest in them. Your purchase helps maintain our investment in these women’s lives, and the response is great: incredible joy and a life filled with dignity.